Want the convenience of having your phone right next to you, but are tired of it falling down on every bump? 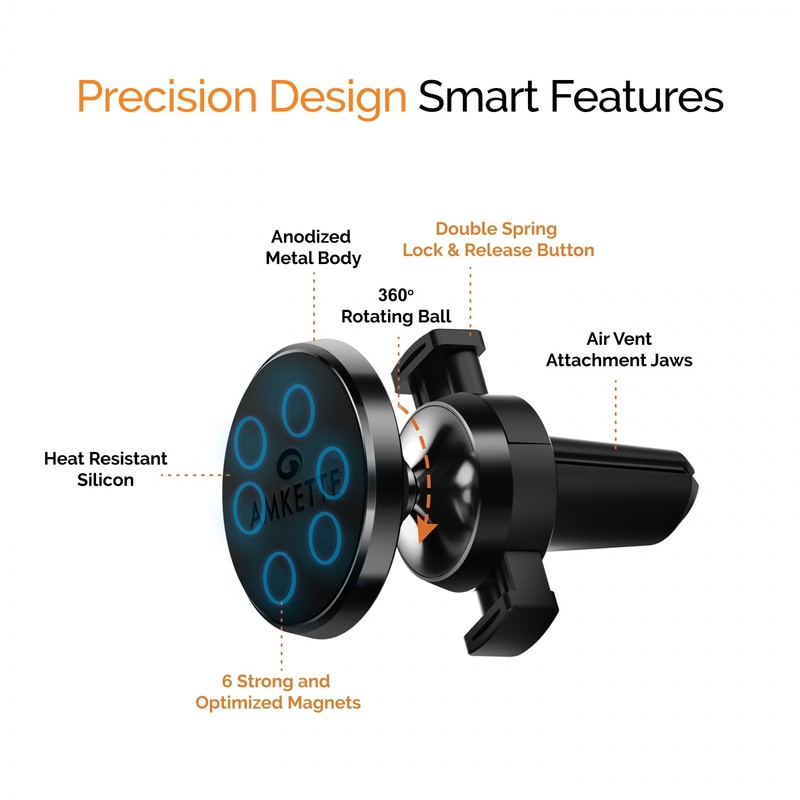 With its TWO SPRING CLAMP and SIX MAGNET design, the Amkette iGrip Magnetic Air Vent Car Mount ensures a super strong grip on your Air Vent, and peace of mind that your phone will always be right where you left it. This may well be the PERFECT MIX of CONVENIENCE and SAFETY. The 6 STRONG MAGNETS have been built for OPTIMAL PERFORMANCE – providing a reliable hold without interfering with the Smartphones functioning. The LARGER SURFACE AREA further ensures a uniform and dependable grip. This improved design offers a stronger and more secure hold on your phone. It might almost feel like it’s MAGIC! EASY TO SET UP and even EASIER TO USE. Designed to be used in your AC Vent, it is always within your reach without obstructing the windshield view. The DOUBLE SPRING CLAMP easily and securely fixes in to most Cars. The ALLOY METAL PIVOT ball allows you to quickly and firmly adjust to an optimal angle and once the metal plate is attached to your phone, it’s easier than 1, 2, 3! Using PREMIUM MATERIALS – from HEAT RESISTANT SILICONE to the ANODIZED METAL BODY and PRECISION MAGNETS – all ensure a product that not only looks great, but will last long as well. 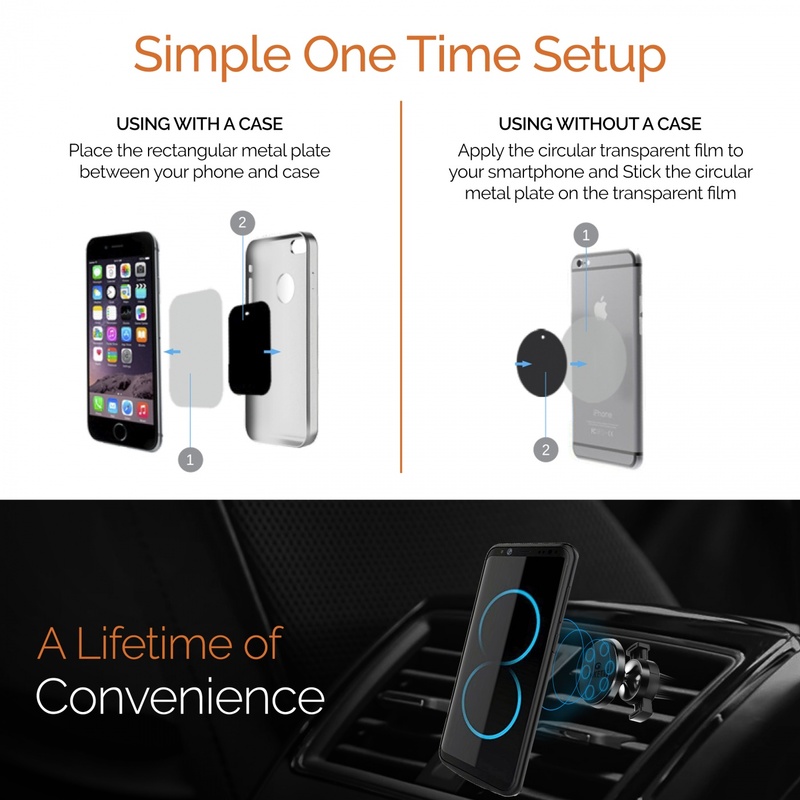 The best part, it comes with MORE METAL PLATES than any other similar car mount, enough to magnetize all your Smartphones. THE AMKETTE ADVANTAGE: While the clamp is designed to be universal, some air vents may not be supported. So check the gallery image, and in case of any issue, there is a 10 day ‘no questions asked’ return window. In addition this product comes with a Hassle Free 1 Year Warranty. REGISTER YOUR PRODUCT, on the Brand Website, for extended warranty. For any assistance, WhatsApp us on +919312691448. 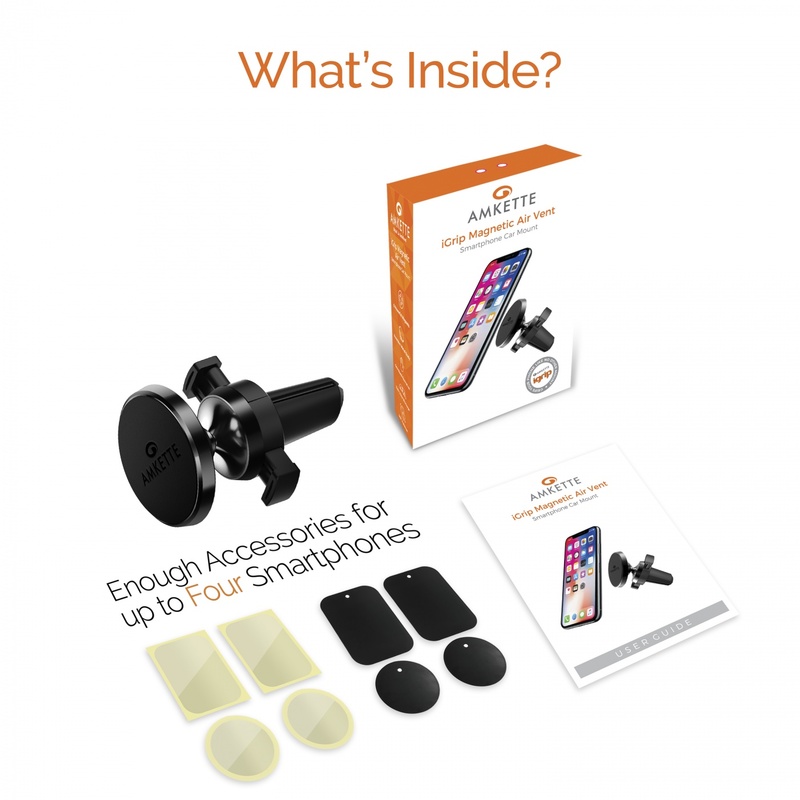 With 6 powerful and optimized magnets, a double-spring loaded clamp, a clean metallic outer body, and heat resistant silicon, the Amkette iGrip Magnetic Air Vent Car Mount offers the safest and easiest option for mounting your phone without hassle. The 6 Strong Magnets magically keep your phone securely in place and are Optimized in such a way that they do not interfere with your phones functioning. The double-spring loaded clamp ensures that the mount gets a super grip onto your air vents. Whenever you’re ready to go, simply pick up your phone and walk out! We have also provided additional metal plates to magnetize all your smartphones. More metal plates than any other competing product! While the clamp is designed to be universal, some air vents may not be supported. We assure the quality of the product and that is the reason we provide 10 day “NO QUESTION ASKED” return window. With superior features and perfect engineering this may well be the PERFECT MIX of CONVENIENCE and SAFETY. Magnetic car mounts are awesome! They keep the phone within hands reach, and don’t block the view. And they are really easy to use – Simply place the phone on you are good to go. Until of course, your phone falls of, or the plastic pivot ball breaks or the spring clamp becomes weak! 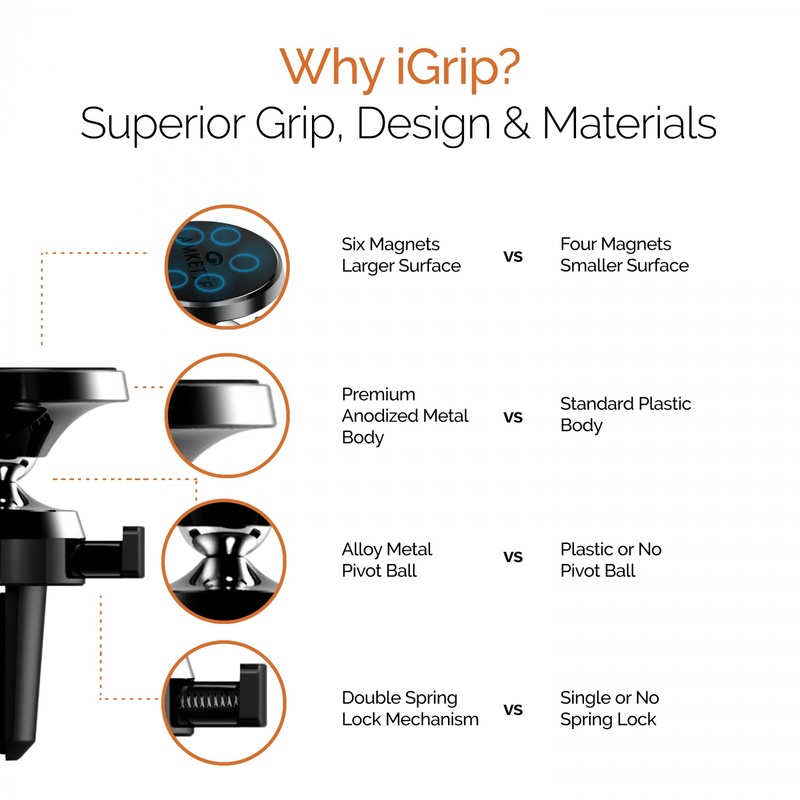 The iGrip Magnetic Air Vent Car Mount takes care of all these issues. this is the Ultimate Magnetic Air Vent Car Mount. Note: While the clamp is designed to be universal, some designs of Air Vents may not work. Please check the gallery image about air vents before buying. 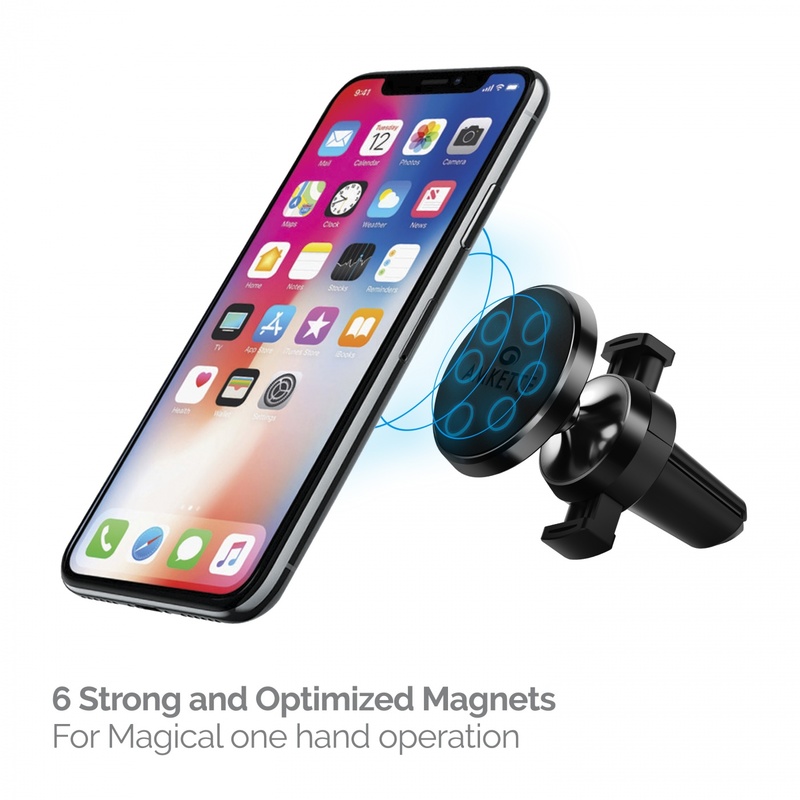 Amkette Magnetic Air Vent Car Mount contains 6 strong and optimized magnets, giving it a better grip to your smartphone. The large surface area ensure a stronger grip as compared to air vent mounts with small surface areas and only 4 magnets. Amkette Magnetic Air Vent Car Mount’s double-spring clamps ensure rock like grip of you mount on to your car’s air vent. We have improved the 1 spring standard clamp design and included a 2nd spring to ensure a stronger grip. Comes with a premium metal body and a metal Pivot ball, designed to provide extra sturdiness and a longer life as compared to plastic air vent car mounts. Many people have more than one phone, and also have more than one driver. We have included a total of 4 metal plates to ensure no phone in your life get’s left out. While some offer additional metal plates at an additional cost, we have included them as a standard accessory. What’s more, we use only 3M double sided tape for a better experience. 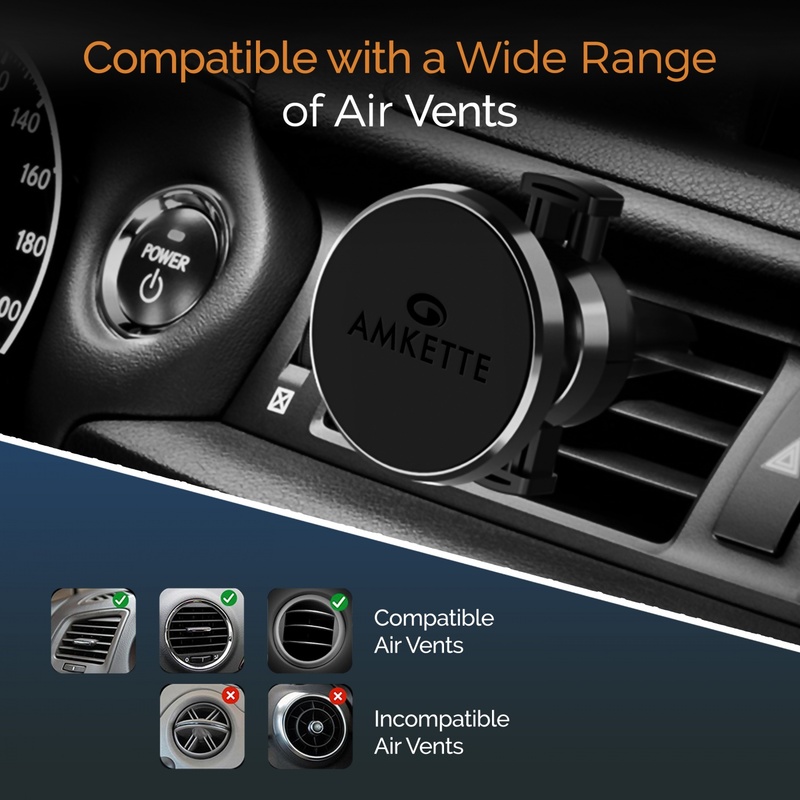 Amkette Magnetic Air Vent Car Mount is designed to deliver long lasting use – in and out of your car. That’s right – you can even use it as a mobile stand on your desk and use the metal Pivot ball to adjust the angle to your level of relaxation! One time Setup – Watch the video! Use the Rectangle Metal Plate. Stick the metal plate directly on the inside of the case after removing the 3M sticker. Stick the Transparent sticker directly on top of the metal plate. Use the Circle Metal Plate. Stick the Transparent sticker directly on the back of the phone. Stick the metal plate directly on top of the transparent sticker after removing the 3M sticker. The Transparent sticker will make it easy to remove the metal plate in the future. Press the 2 buttons on either side of the clamp to open the Double Springs Jaws. Gently insert the mount in to the Air Vent and Release. You may need to experiment to find the ideal location for your car. Adjust the angle of the Metal Pivot Ball till comfortable. Simply place your phone over the surface area, and witness the Magic of Magnetism. 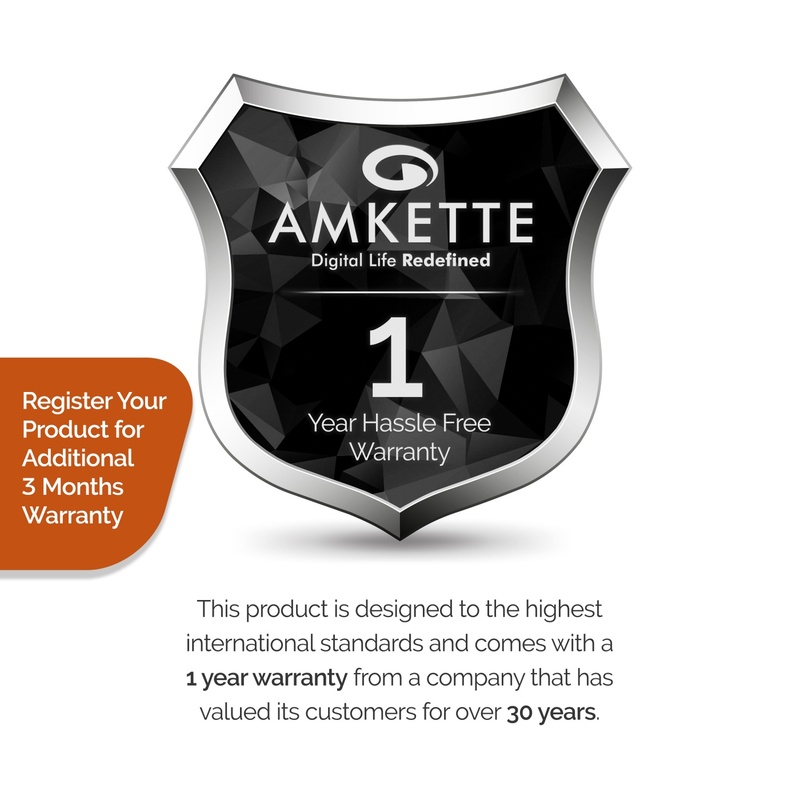 Amkette cares about your overall driving experience. That’s why we have developed not just a High Quality Car Mount, but also a Digital Assistant to help better manage your Vehicle. Simple input for every time you fill up your tank. Maintain a Fuel Log. Automatically displays your Cars Mileage and Cost per KM. Use GPS to mark your cars Parking Spot or a simple input to remember you parked in the 2nd basement! Interesting and Useful Vehicle data like monthly spend, best mileage, cost per km and more.